This is a little number I dreamed up after enjoying a delicious warm greens dish at a little restaurant down the street the other night. I love how the warm dressing softens the greens just a little bit, and the combination of sweet currants, salty cashews, and bacon fat really make this salad go down easy. The salad would be amazing with any number of young greens, alone or in combination – kale, mizuna, chard, spinach, etc. Fortunately all of these things are popping up in backyards and farmer’s markets all over the place in Portland these days (and it won’t be long if you’re somewhere colder, I promise!). Mr. Tummyrumblr and I divided this bowl between us and enjoyed it as a light lunch. I think it would also make a perfect side dish for a simple dinner of steak and baked potatoes. Cook the bacon strips over medium low heat until crisped to your liking. Set the cooked bacon aside and place the sliced onion and currants in with the bacon fat that remains in the pan (let’s hope there are at least 2 Tbsp. or you might want to buy some different bacon). 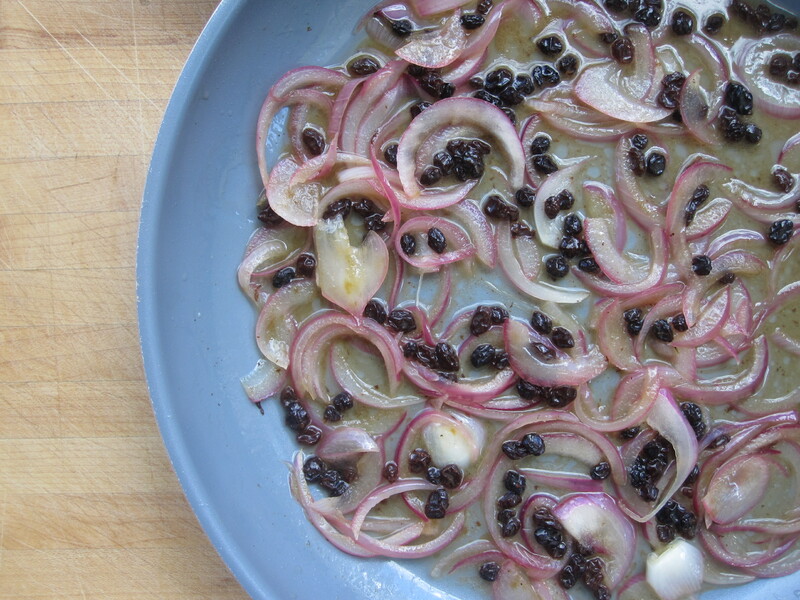 Allow the onions to soften and the currants to plump – about a minute should be fine. Add the apple cider vinegar, tasting to find an acidity that you’re comfortable with. Then bring to a simmer and then turn off the heat. Place your greens into a large bowl and pour over your warm dressing. Chop the bacon and add it to the bowl along with the cashews and grated cheese. Season the salad with a good pinch of salt and plenty of freshly ground pepper, and toss together gently to distribute the dressing. *Some great substitutions for the currants would be dried cranberries, chopped dried cherries, or even chopped fresh green apple. This entry was posted in gluten free, perfect health diet, salad and tagged bacon, dressing, gluten free, kale, perfect health diet, salad. Bookmark the permalink.